Friday, November 2, 2018, 8:00 p.m.
Concert and recording artist Christa Rakich currently directs the music program at St. Mark the Evangelist Church in West Hartford, CT, in addition to her appointment as Artist-in-Residence at First Congregational Church in Somers, CT. Previous Artist-in-Residencies include the University of Pennsylvania and First Lutheran Church in Boston. Teaching posts have included New England Conservatory, Westminster Choir College, Brandeis University, and the University of Connecticut. She has also served as Assistant University Organist at Harvard University. Rakich’s performing career has taken her throughout North America and Europe. 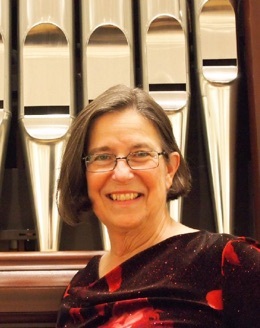 Active in the American Guild of Organists, she has served as Dean of the Northeast Connecticut Chapter and as a judge for competitions at both regional and national levels, for both repertory and improvisation. She has been a member of the National Committee for Organ Improvisation, and appears regularly as a performer and presenter at AGO conventions. A prizewinner at international organ competitions (notably Bruges 1976), Rakich has received particular acclaim for her interpretations of the music of J.S. Bach, such as her celebrated recording of the Leipzig Chorales and her most recent release, a 2-CD set of his Trio Sonatas. Other released recordings include Deferred Voices: Organ Music by Women Composers, and Transcriptions from St. Justin’s, both made on the 1932 Kilgen organ at St. Justin’s Church in Hartford, and Christa Rakich in Recital at St. Mark’s Cathedral, a live recording of her performance at the 2000 National AGO Convention in Seattle. When Westminster Presbyterian Church commissioned Richards, Fowkes & Company in 1994 to build their Opus 7, what was envisioned was an instrument that would benefit not only the worship of the congregation but also music making in the community and the entire region. At the same time, Westminster was building a new sanctuary, incorporating into the design an ambiance and acoustic that would lend beauty and support to worship and musical offerings. The church was fortunate to have architect, acoustician, and organ builder in collaboration as this vision was brought into being. Richards, Fowkes & Company's Opus 7 was installed and voiced beginning in September 1998 and was dedicated the following May with a recital given by Robert Clark, who served as the consultant. The organ is 33 ranks, with 25 stops on two manuals and pedal. Richards, Fowkes & Company's Opus 7 is strongly influenced by the work of Arp Schnitger and the North German/Dutch tradition and yet reflects an eclecticism that successfully supports the wide range of musical demands placed on it by the many periods of church music included in worship and concerts at Westminster. Its sensitive mechanical action provides the player with an extraordinary intimacy of touch and infinite degree of control over the manner in which the air enters each pipe. The approach to voicing produces a warm, vocal, well-blended sound with color and interest; moreover, because the stops can be combined successfully in both conventional and uncommon ways, the instrument is very versatile and offers the player great artistic freedom. The sound is inviting and enveloping, intended to inspire the singing of hymns and other service music, accompany the choirs, and convincingly play most of the great organ literature. Westminster is now sharing this wonderful new instrument and setting with the community and region in an annual series of organ recitals, Musica Organi. Many of the world's premier organists are being brought to our area as part of Westminster's musical outreach. The inaugural season, 2000–2001, featured recitals by Aart Bergwerff, David Higgs, and James David Christie. In 2001–2002 the recitalists were Douglas Reed, Edward Parmentier, and Christa Rakich. For the 2002–2003 series the organists were Robert Clark and Hans Davidsson, and for the 2003–2004 series Jacques van Oortmerssen and Craig Cramer. The 2004–2005 season featured John Rose and Pamela Ruiter-Feenstra. For the 2005–2006 season the recitalists were David Yearsley, Christa Rakich, and Pieter van Dijk. Performing for the 2006–2007 series were Magnus Kjellson and Peter Westerbrink. In the 2007–2008 series were Sietze de Vries and Annette Richards. The 2008–2009 season featured Annette Richards and Gail Archer. In 2009–2010, David Arcus and John Grew performed. The 2010–2011 season included Charles Boyd Tompkins and a return of Craig Cramer. In the spring of 2012, the season presented Stephen Hamilton and Peter Sykes. Performers in the spring of 2013 were Luc Beauséjour and Balint Karosi. Artists for the 2013–2014 season were Kimberly Marshall and Robert Bates. In the spring of 2015, the artists were Matthew Dirst and Edoardo Ballotti. The 2016 artists were Christopher Houlihan and Christian Lane, and in 2017 they were Paul Tegels and Boyd Jones. In the spring of 2018, the artists were Nathan Laube and Pamela Ruiter-Feenstra. 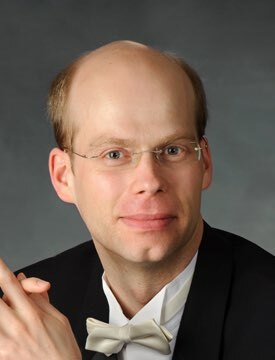 Jens Korndörfer is Director of Worship and the Arts, and Organist at First Presbyterian Church of Atlanta, GA, and instructor of organ at Georgia State University and Agnes Scott College. He maintains a busy concert schedule at major venues and festivals around the world. Highlights include solo concerts at Westminster Abbey, Notre Dame Cathedral, the Royal Chapel in Versailles, Moscow Cathedral, Berlin Cathedral, the Münster in Ulm, Oslo Domkirke, Suntory Hall and Metropolitan Art Space in Tokyo, Kyoto Concert Hall, and the Cultural Centre in Hong Kong. Korndörfer has also given many master classes and presentations. In addition, he has published in American, Belgian, British, French, German, Russian, and Swiss music journals, and has served on the jury of the Quimby Competition (2015). A native of Germany, Korndörfer pursued his studies in Germany, France, the United States, and Canada. He holds a Church Music Diploma from the Musikhochschule in Bayreuth, an Organ Diploma from the Conservatoire National Supérieur de Musique in Paris, an Artist Diploma from Oberlin Conservatory, and a D.M.A. from McGill University. In September 2005 he was appointed organist in residence at the Concert Hall Kitara in Sapporo, Japan. During one year, he gave approximately fifty recitals at major venues throughout Japan, made two recordings, concertized with orchestras (Sapporo Symphony Orchestra and the Filarmonica Arturo Toscanini under Lorin Maazel), gave master classes, and taught private lessons. Korndörfer is a triple prizewinner of the Canadian National Organ Competition (2008 and 2011). He has recorded three CDs: two solo recordings and one in collaboration with Kazuhiro Maekawa, solo trumpeter of the Sapporo Symphony Orchestra. A recording of the renovated Klais/Schlueter organ (IV/112) at First Presbyterian Church of Atlanta is currently in preparation. Jens Korndörfer is represented by Karen McFarlane Artists, Inc., in North America. Friday, February 8, 2019, 8:00 p.m.